As I watched the Academy Awards last week, I was struck by how little the winners trusted their works of art. The ceremony was peppered with political statements for one cause or another. (Don’t misread: I have sympathies for these causes, but not for taking over the ceremony to smash us over the head with the cause.) There were pleas for women’s rights, civil rights, gay rights, and disability rights. Really? Their work of art, the film that was being recognized, had already said what needed to be said in poignant, touching, and life-changing ways. Why didn’t they trust their art? In the 1970s, children’s book publishers put out a lot of “problem novels,” which addressed social issues. The backlash against them was huge and still has echoes today in how easily some manuscripts are rejected. Since then, though, we’ve learned how to include our passions in our stories in ways that shine as art. We don’t stick it in our reader’s faces. Morality. If you’re passionate about a cause, though, what should you do? First set up a moral dilemma around the cause because that will allow you to explore multiple perspectives. Moral dilemmas force characters to make a choice, which allows your readers to feel the weight of the issues and either agree or disagree with the character’s choices. You almost have to include someone making wrong choices–usually as the villain. Emotions. 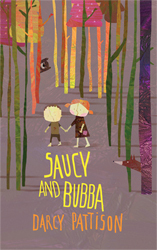 For example, in my book, Saucy and Bubba: A Hansel and Gretel Tale, Saucy runs away from an alcoholic step-mother. She must decide whether to live with an aunt or go home to live with her father and the step-mother. It’s a moral choice, but also an emotional choice, complicated by the question of where will her little brother go. Plurality. We live in a pluralistic culture; that is, many different cultures co-exist peacefully, and our work should respect that variety of cultures. Your ideas must compete in the marketplace of ideas and as time passes, certain ideas will gain popularity and others will fade. Yes, there are some things that are right and some things that are wrong; I believe in some absolutes (Thou shalt not kill!). But some things DO depend. As you write, recognize the variety of ideas possible and work to include characters who bring those ideas to enrich the story you are telling. Trust your art. In the end, I choose to trust my art. Growing up, I had an alcoholic step-father; today, about 11 million children live with a caregiver who is an alcoholic. I could rant; instead, let me tell you a story. Read a sample chapter or listen to the audio of Chapter 1 of Saucy and Bubba. Great post! I’ve really been working on trusting my art. I’ve recently noticed that I fall in the pattern where I finish my first draft, revise for a long time but never query! I’ve set myself deadlines now for when I need to be done revising and when I need to start querying No Matter What. Wow, well said. This really connected, and put into words something I didn’t consciously recognize while watching the same awards show. Great insight. Thanks Darcy!